After years of expanding their brutal insurgency, the downfall of ISIS may finally be upon us. The Turkish military has really stepped up their involvement in combatting ISIS recently, and it’s starting to show some serious gains, especially with the most recent piece of promising news: Turkish troops have forced the terrorist group to withdraw from the Caliphate Adventure Theme Park in Northern Syria, a strategically important playland containing 102 acres of thrilling, pulse-pounding rides. This is a huge step forward toward peace in the region, and it’s been a long time coming. Losing the amusement park is a crippling blow to ISIS, preventing them from accessing Syria’s most insane roller-coasters and totally white-knuckle spinning rides. Turkish fighters and allied Syrian rebels conducted a grueling 48-hour assault to liberate the park’s five different themed sections. The ghost-themed Haunted Manor and 400-foot free-fall ride Precipice Plunge were first to be taken, followed soon after by a spinning teacup ride. After a brutal day-long siege, American airstrikes finally pried ISIS militants out of the petting zoo and Mega Splash Central, the park’s impressive set of waterslides. Social media has been flooded with photos from celebrating Turkish soldiers, who have posted pictures of themselves walking through the park eating turkey legs and funnel cake. Without the usual long lines of ISIS fighters, the Turkish forces have been able to ride Fire Dragon, an old-school wooden coaster, several times in a row without any waiting time. The theme park’s costumed mascot, Emil the Emir, was reportedly killed in the bombing. It’s hard to overstate how badly this victory has damaged ISIS’ position. 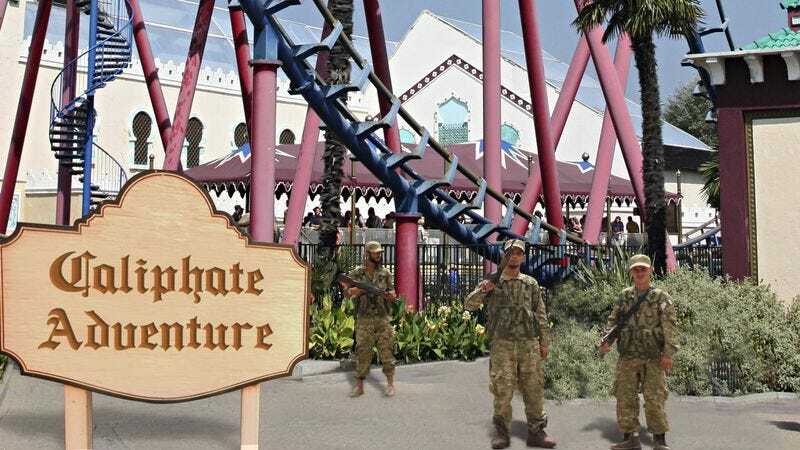 Without Caliphate Adventure’s incredible rides, arcade games, gift shops, and dining experiences, the terrorist organization has lost a vital source of fun for the whole family. Intelligence analysts say that now ISIS will have to rely on inferior amusement parks like Wahhabi Wildlands, which is much smaller and doesn’t even have bumper cars. After years of horrific warfare and unspeakable atrocities, it looks like Syria is finally turning a corner. With more successes like this, it won’t be long until ISIS is a thing only found in history books.